2-in-1 Asian Pear Tree | Gurney's Seed & Nursery Co.
Now Grow Pears Two at a Time! That's right! You can grow two completely different varieties on one tree! Chojuro, a delightful, butterscotch-flavored type hangs alongside Drippin' Honey™, a crisp, sweet variety.Harvest time is extended due to the differing maturity dates. Chojuro is ready in September while Drippin' Honey waits'til October. Self-pollinating. Zones 5-8. FormDeciduous. Upright and semi-spreading at maturity. 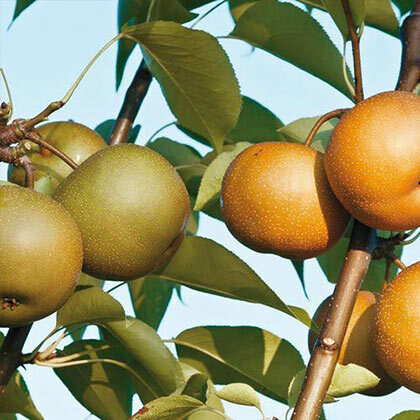 ColorChojuro Fruit is orange-brown russet when fully mature. Drippin Honey - golden russet. FruitLarge, 3 inch super sweet, crisp and very juicy. Soil RequirementsWell-drained average fertile soil. CommentsChojuro has a crisp texture and rich butterscotch flavor. Drippin Honey is delightfully crisp and honey sweet. Fruit has long storage; 6 months in common refrigeration. Tree has excellent resistance to disease and many insects. Extend your harvest season and get 2 tasty pears on 1 tree! RESTRICTED STATES, AE, AK, GU, HI, PR. 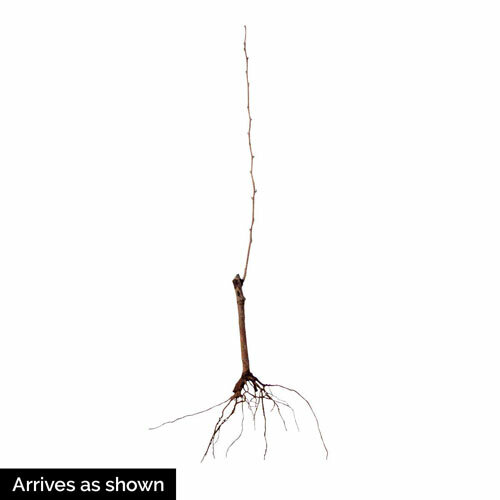 DepthGraft union should be planted 2 inches above the soil.